We are proud to sell quality dock bumpers with the bumper wheel from Manitou Products Limited. 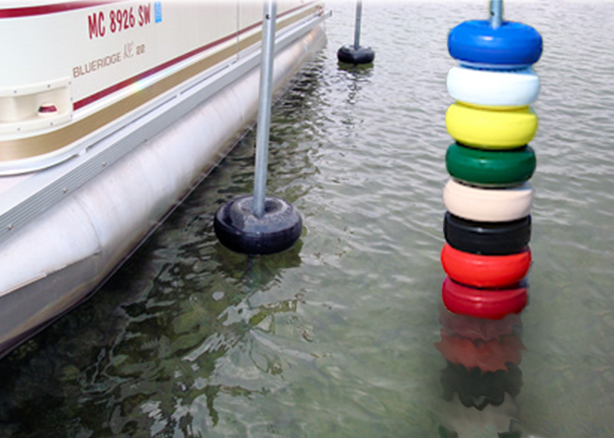 Each bumper wheel is specifically designed for boats, pontoons, and more. The bumper wheel is made of molded vinyl, making it durable and water tight. With the bumper wheel, you’ll never have to worry about your watercraft knocking into your boat dock ever again. Each bumper wheel is fitted with a 2-inch hole in the center that a dock post can fit through. The bumper wheel then floats at water level upon the dock post to keep your watercraft from running into the posts or boat dock. The bumper wheel is 4 inches thick to ensure nothing hits your boat dock. With an integrated needle style valve to inflate it, the bumper wheel is easy to set up and provides quality protection for your boat and other watercraft.